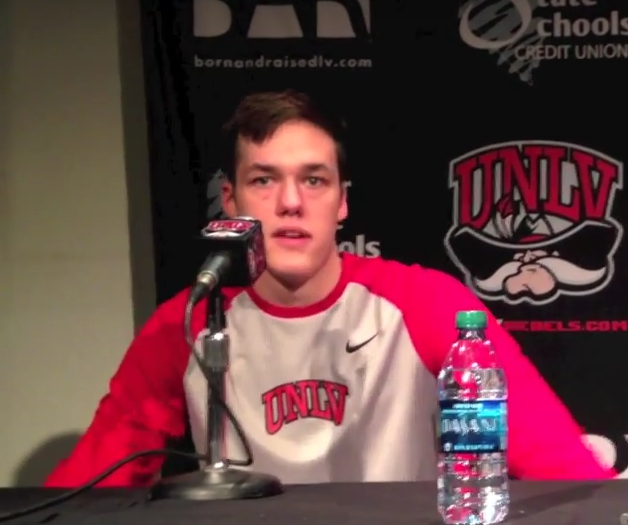 It took exactly 18 seconds for highly touted freshman forward Stephen Zimmerman to score his first official college basket for UNLV on Friday night, a silky 18-foot baseline jumper. It took all 40 minutes, though, for the Runnin’ Rebels to finally put away a 74-72 victory over pesky Cal Poly at the Thomas & Mack Center. Senior point guard Jerome Seagears sank a pair of free throws with 14 seconds left that proved to the game-winning points and the Rebels (1-0) overcame 19 turnovers and poor free throw shooting down the stretch – missing 5-of-7 during one 62-second span – to avoid joining teams like Wisconsin, UCLA, Boise State, Arizona State and North Carolina State in getting upset in their season-openers. Sophomore guard Patrick McCaw led UNLV with 15 points, including a pair-of-3-pointers to highlight a 15-2 spurt to start the second half as the Rebels built a 13-point lead and then held off a late charge by the Mustangs (0-1). Zimmerman just missed a double-double, finishing with 12 points and a game-high nine rebounds to go along with three blocks while Seagears added 11 points and five assists and sophomore forward Dwayne Morgan and freshman forward Derrick Jones Jr. each chipped in with eight points. Cal Poly stayed in it by converting 19 Rebel turnovers into 26 points and finished with a 16-9 edge in second chance points. UNLV also shot just 62.5 percent (25-of-40) from the free throw line, including 11-of-19 (57.9 percent) in the second half. 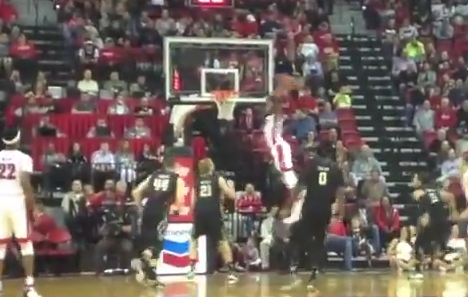 Still, the Rebels made the plays when they had to in crunch time, something that has been sorely lacking at times over the last couple of seasons. The Rebels blanked the Mustangs for over seven minutes while starting the second half with a12-0 run to take control of the game. Zimmerman started the rally with a three-point play off an assist by Seagears. Zimmerman, the centerpiece of four consecutive state championship teams at Bishop Gorman High, connected on 4-of-9 field goals and 4-of-5 free throws in 24 minutes in his debut. UNLV returns to action on Monday night when it hosts New Mexico Highlands (1-0), an 85-77 winner over in-state rival Eastern New Mexico on Friday, at 7 p.m. at the Thomas & Mack.